For too many students today, opportunities to explore the things that fascinate them and grow their strengths aren’t within their reach. Numerous barriers--from unfair tests needed to qualify for highly capable programs to preconceived notions about whether certain students can succeed in advanced programs--exclude marginalized populations from programs to accelerate their learning. On Feb. 9, Fonseca and other local students shared their personal experiences with these barriers as part of the University of Washington’s Equity Summit on Gifted Education. “The right for kids to learn is the key civil rights issue of our time,” said Ed Taylor, professor of education, vice provost and dean of Undergraduate Academic Affairs, during the summit’s opening session. 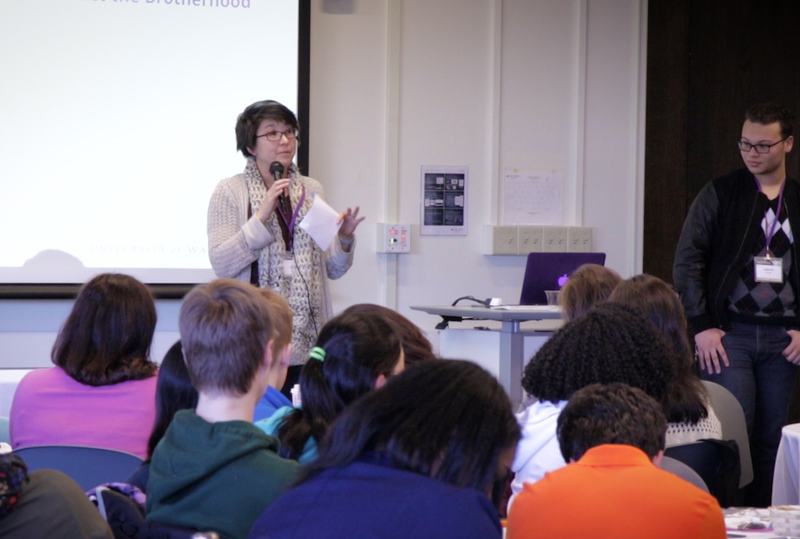 The summit, organized by UW College of Education Professor Nancy Hertzog, brought together more than 300 educators, researchers, community members and students to discuss how to open access to accelerated learning opportunities for all. Hertzog, noted that numerous studies and data shared by presenters at the summit demonstrate the disproportionality in access to gifted education and advanced curriculum. In many poverty-impacted schools, for example, strict pacing guidelines hold back students’ progress and there is less access to arts programs. Dan Finkel, founder and director of operations of Math for Love, spoke about the importance of empowering all students to practice critical thinking, ask questions and experiment with solutions. “When kids are interested in the problems, they work really hard at them,” Finkel said. Educational systems need to teach to the strengths of the children and recognize children for their strengths (e.g., bilingualism). Schools need to reexamine the entrance procedures for highly capable programs, as well as definitions of giftedness, to make meaningful structural changes. Professional development is essential to having teacher beliefs and attitudes about students change from a deficit to a strength perspective. Educators and leaders need to start questioning the way things have always been done—and work with communities to make change.